Mary’s life as a proper lady came to a crashing halt when she discovered her father not only had embezzled from his company, but he killed himself in shame. She could do nothing about the embezzlement, but she made it her mission to keep the suicide a secret, so that he could receive a proper burial. Unfortunately, her quick escape to hide the body only served to make her look complicit in the crime. Fast forward a year and a half, and Mary is living in misery. She is a companion to a woman trapped by a domineering husband. And Mary is trapped too. Her employer withholds her wages and keeps her from leaving. She holds out little hope for anything better. Until John walks back into her life. He was her fiance when the disaster happened with her dad and she walked away from him, thinking never to see him again; thinking he never really loved her at all. Meanwhile, John believes it was Mary who never really loved him; and that she is hiding the money her father stole, money that was supposed to go toward his nephew’s inheritance. He tries to cozy up to her, in the hopes of convincing her to reveal her secrets. But their time together only serves to rekindle the feelings between them. It’s easy to sympathize with both Mary and John. Courtney Milan does a great job showing how each of them truly believes they are the only one to love the other. Both characters are afraid to risk their hearts, but it makes it that much sweeter when they stop fighting their own feelings. Their love story is heartfelt, easy to root for, and totally emotionally believable. This was originally published in the Midnight Scandals anthology. Nice Review!! Sounds like a keeper. Putting on my tbr!!! I do enjoy Milan’s books. i read this one recently and really liked it, too. 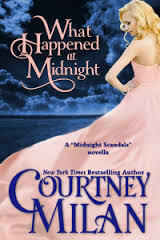 courtney milan has a way with writing great, heartfelt stories, even if they are short.